There’s a well-known saying that a dog is man’s best friend. In 1927, a Vanderbilt student in Nashville Tennessee took this relationship to a new level. Morris Frank, a blind 20 year old, had been using a guide boy to get around. The boy grew tired and Frank found himself frequently without help to get around. 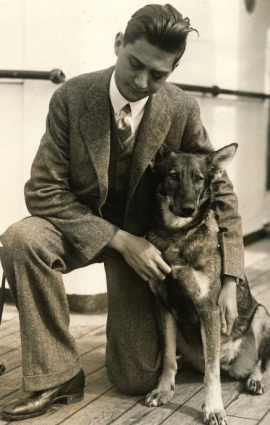 After hearing about dogs that were being trained by shepherds to help the blind, he traveled to Europe to investigate the possibility of training a dog for himself. There he met with Dorothy Eustis, a woman living in Switzerland who had seen dogs lead blind people. After an invigorating trip working with this early version of a service dog, Frank returned home to begin training his own dog. His ability to get around with the help of a dog amazed people. 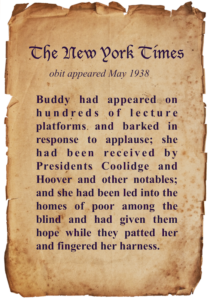 With confidence that trained guide dogs could help others as well, in 1929 Frank, Eustis and others founded The Seeing Eye, a guide dog institution that operated in Nashville until it relocated to New Jersey. In its first decade, around 350 guide dogs were trained. 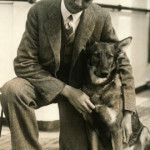 Frank’s personal dog, Buddy, died in May 1938 after a long and famous life as a national hero. The New York Times expressed the love felt by many when it posted an obituary honoring the canine hero. Frank’s second dog, Buddy II, also became famous and was also honored with mention in the local paper when he died. Both Buddys are buried beside each other at The Seeing Eye. The Seeing Eye is still training dogs today. It shares many of the same values Lions Club International; to improve the quality of life and dignity of the blind.